Less than a year ago, my husband and I decided we were going to cut some expenses on food and buy only those we can’t make at home. We’re already getting some meat and plenty of eggs from the chicken and quails we raise in our backyard, vegetables from our garden, and some fruits from the property. When I began preserving and canning fruits and vegetables we harvested in the summer, I realize we can actually save some money. Then I started baking bread and actually loving it. Right now, we only buy commercial sliced bread every once in a while. We are of family of six and food is something that I don’t worry about getting bad because it gets used up very fast especially when it comes to bread. This basic white bread recipe is adapted from Allrecipes.com. Since the first time I made this, it has become a regular bread in the house. 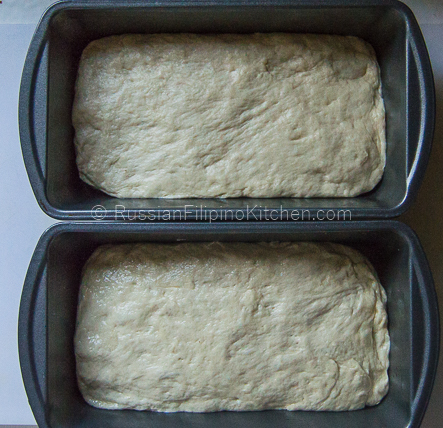 The recipe yields 2 loaves which we usually consume within 2 days, sometimes even less. 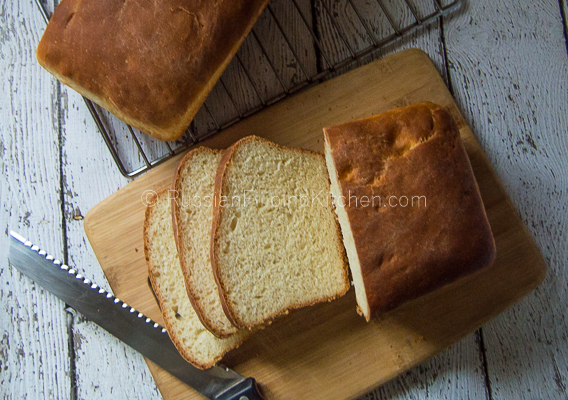 In my opinion, this is by far one of the simplest, easy to make, and best white bread I have ever tried. It’s crusty on the outside and soft and fluffy inside. 1. Fill a liquid measuring cup with 2 cups of warm water and use a food thermometer to make sure the temperature is at 110ºF or 45ºC. 2. Pour warm water into a large mixing bowl. Add the sugar and stir to dissolve. 3. 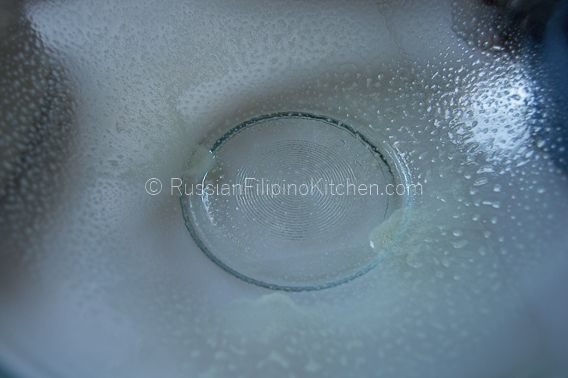 Stir in the yeast and set aside to activate (until it gets frothy or bubbly), about 10 minutes. 4. Pour in the oil and salt and mix thoroughly. 5. Add the flour into the mixing bowl one cup at a time and mix using a spatula until it forms into a dough. 6. Sprinkle a clean flat surface with flour. Transfer the dough and knead. Use the heel of your hand to press and stretch the dough, fold it over and rotate 90 degrees. 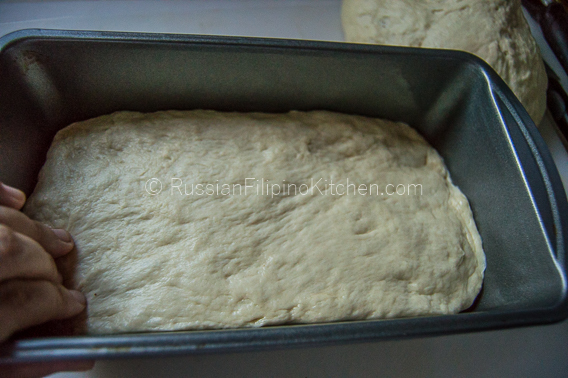 Repeat process until the dough is elastic and smooth. Click to watch a video on how to knead dough by hand. 7. Lightly oil a clean mixing bowl and place dough in it. Turn dough over to coat the other side with the oil. 8. Cover with a damp towel and let it rest in a warm place until it doubles in size, about an hour. I place mine inside the microwave. Before I do this, I microwave 1/2 cup of water in a Pyrex glass for 3 minutes on high then place this at the back corner inside the microwave. I place the covered dough inside and close the microwave door. 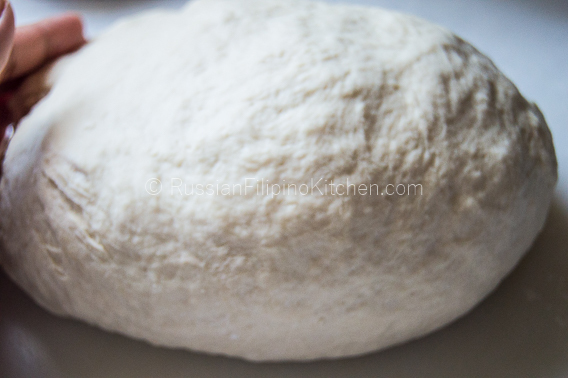 It keeps it warm and moist, perfect for the dough to rise. 9. Remove dough from microwave and remove cover. 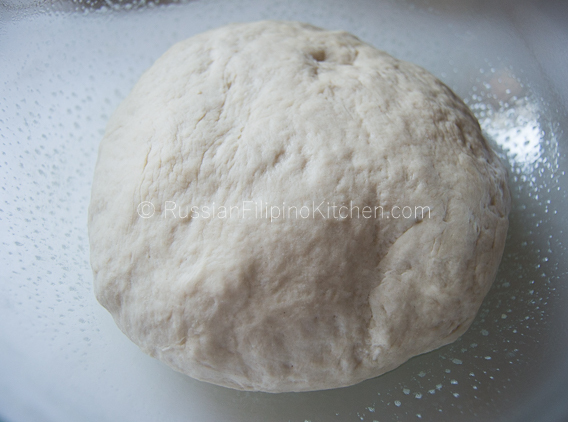 Punch the dough with your knuckles and transfer to a flat surface again and knead for a minute. Divide into half and shape each into a loaf. 10. 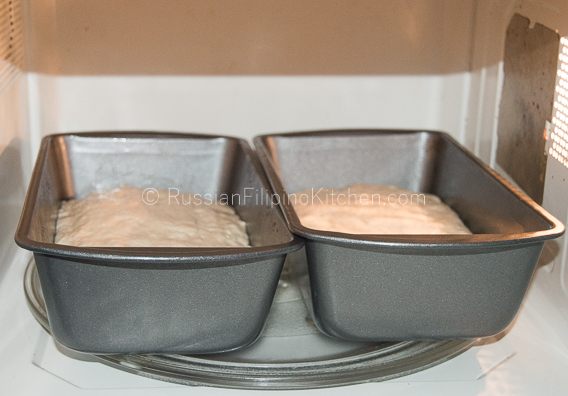 Lightly grease the 2 loaf pans and place each loaf in it. 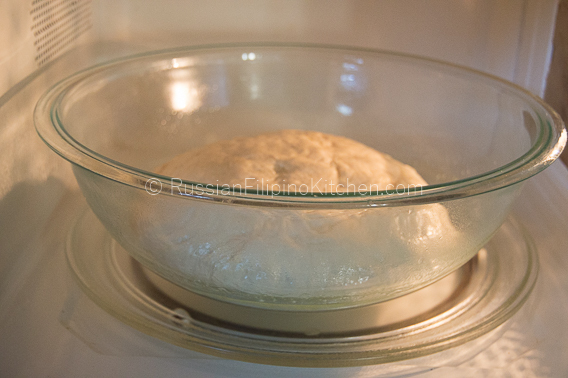 Let rise again for 30 minutes or until dough has risen 1 inch above the pans. Preheat oven to 350ºF 15 minutes prior to baking. 11. (optional step: applying egg wash to make bread crusts shiny and brown)Mix one egg and a tablespoon of milk in a small bowl. Brush egg wash on top of each loaf. 12. 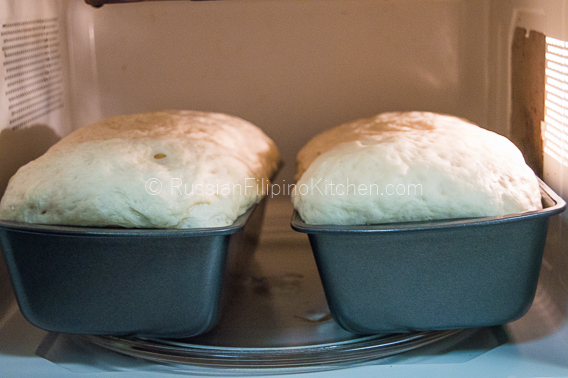 Place loaf pans inside the oven and bake bread for 30 minutes. 13. 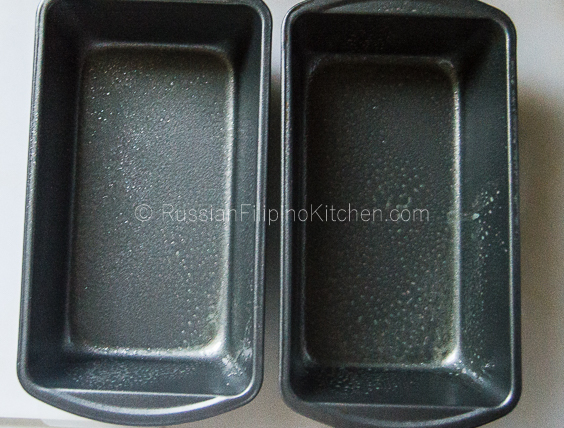 Remove from pans immediately and allow to cool on wire rack. Store in airtight container to keep fresh.